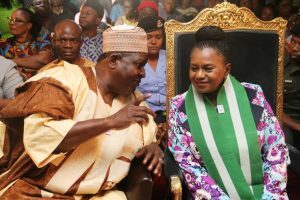 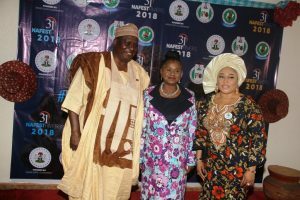 LEFT-RIGHT: OTUNBA SEGUN RUNSEWE, DG( NCAC)AND PRESIDENT, WORLD CRAFTS COUNCIL( AFRICAN REGION) BUTTERING A POINT TO DAME DR. MRS. IPALIBO HARRY BANIGO, DEPUTY GOVERNOR, RIVER STATE DURING THE NATIONAL TECHNICAL MEETING OF NAFEST 2018, SLATED TO HOLD IN RIVER STATE IN OCTOBER THIS YEAR. 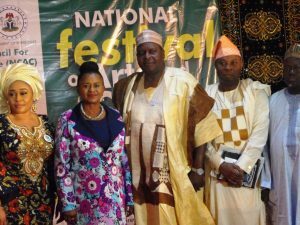 LEFT-RIGHT: OTUNBA SEGUN RUNSEWE, DG( NCAC), DAME DR. MRS. IPALIBO HARRY BANIGO,DEPUTY GOVERNOR, RIVER STATE,DSSRS, AND MRS. TONYE BRIGGS ONIYIDE COMMISSIONER FOR CULTURE AND TOURISM RIVER STATE IN A GROUP PHOTOGRAPH DURING THE NATIONAL TECHNICAL MEETING OF NAFEST 2018, SLATED TO HOLD IN RIVER STATE IN OCTOBER THIS YEAR. 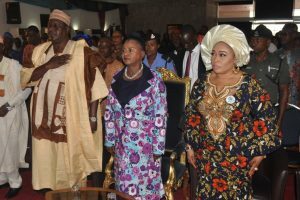 .LEFT-RIGHT: OTUNBA SEGUN RUNSEWE, DG( NCAC), DAME DR. MRS. IPALIBO HARRY BANIGO,DEPUTY GOVERNOR, RIVER STATE, MRS. TONYE BRIGGS ONIYIDE COMMISSIONER FOR CULTURE AND TOURISM RIVER STATE AND BABATUNDA AJIBOLA, REPRESENTING PERMANENT SECRETARY OF THE CULTURE MINISTRY IN A GROUP PHOTOGRAPH DURING THE NATIONAL TECHNICAL MEETING OF NAFEST 2018, DURING THE EVENT..
RIVERS STATE SET TO MAKE HISTORY WITH NAFEST 2018.